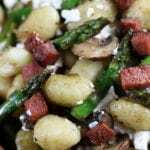 Gnocchi Asparagus and Mushroom Skillet is delicious and easy weeknight comforting dinner. 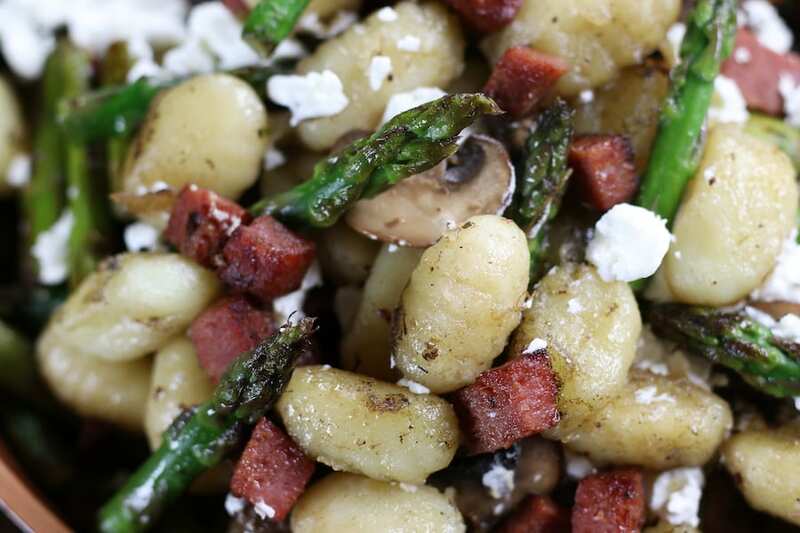 Has crispy salami, sautéed asparagus, mushrooms, gnocchi and chèvre. My mouth waters just thinking about this meal. Do you have a food that you really enjoy eating but don’t get to because someone in your family detests it? That food for me would be asparagus. My husband, although not a hugely picky eater, has made it very clear that he does not like asparagus by renaming it Devil Sticks. I really took a huge gamble in making this gnocchi dish with said Devil Sticks. Why you ask? Let me share a few stories. Also, I was once drug across the front of a store while holding hands with my husband because he had to keep a safe 1,000 foot distance from his most detestable food, cantaloupes. Needless to say, when he doesn’t like a food and I try to make it for our dinner, I will pay the price for a long time to come. The good news is that this Gnocchi Asparagus and Mushroom Skillet was delicious enough that he just ate around the Devil Sticks with just minimal amount of whining and enjoyed the rest of the dish. Gnocchi is a little Italian dumpling made of flour and potato. It’s a fun marriage of pasta and dumplings that are hearty and yet fluffy. They work well with sauces like this Easy Weeknight Spinach Pesto Gnocchi, Gnocchi with Pomodoro Sauce or Parmesan Spinach Gnocchi. Gnocchi also tastes great in soups and stews like Italian Beef Stew and Pumpkin Gnocchi Soup. To cook gnocchi you simply add to boiling water and stir. They are cooked when all have risen to the top, usually within 3-5 minutes. 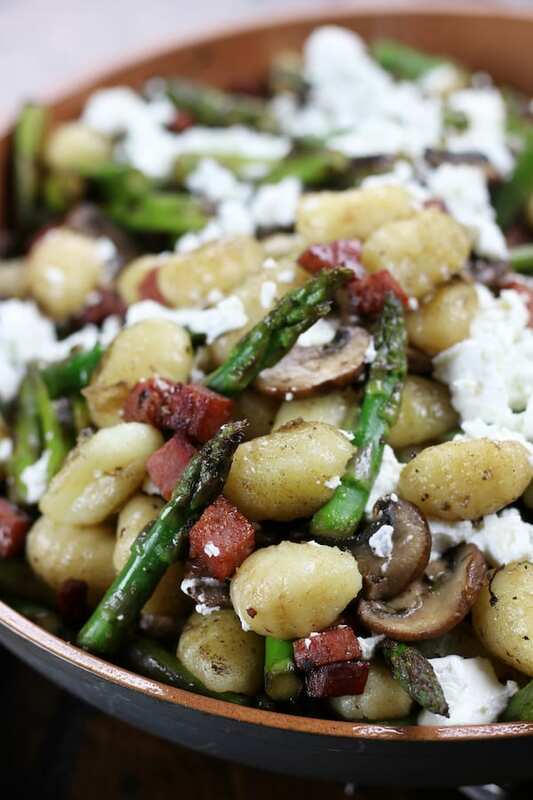 For this Gnocchi Asparagus and Mushroom Skillet recipe the gnocchi will need to be parboiled. Here are a few tips to keep in mind. If using prepackaged gnocchi make sure to separate the gnocchi before adding to the boiling water. Doing this step in addition to using this tool to lower the gnocchi into the water will prevent boiling water from splashing up onto to you. The minute the first gnocchi floats to the top, turn off heat source and use the same slotted spoon to transfer to the frying pan. This last step will finishing the cooking of the gnocchi and will give them a fun, partially crispy texture. If you are like my husband and feel like asparagus are Devil Sticks here are more veggie options that will taste delicious. Which ever vegetable you choose, make sure to cook to your desired tenderness. Also, a little extra oil will be needed if choosing eggplant. Pro Tip: Cut larger veggies into bite size pieces and you will need about 2- 3 cups of veggies total. Where do I find gnocchi in the store? Prepackaged gnocchi generally is on the same isle as pasta and pasts sauces. Yes but I personally would not recommend it. I think this gnocchi skillet dish taste best fresh. 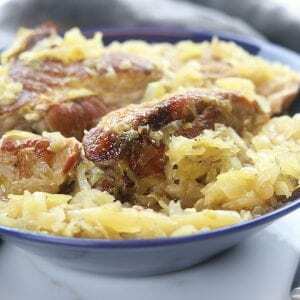 How long will this meal last in the refrigerator and how do I reheat? This gnocchi meal will last 3-4 days in an airtight container. 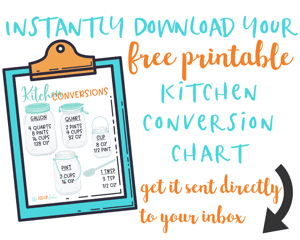 Leftovers can reheated in individual portions in the microwave for 3-4 minutes on power level 8. Another option would be in a frying pan, covered over medium heat with about 1 tablespoon of water for about 10 minutes or until gnocchi becomes tender. Where do I find salami that isn’t already pre-sliced? Most service deli’s will carry salami that is uncut. I told them I needed 1/3 of a pound uncut. Once at home I used a sharp knife to cut the larger chunk of salami into smaller chunks. What can I replace the salami with? Diced pancetta or diced bacon could be a fun alternative to salami. Pro Tip: Salami, unlike bacon and pancetta, can be eaten uncooked. 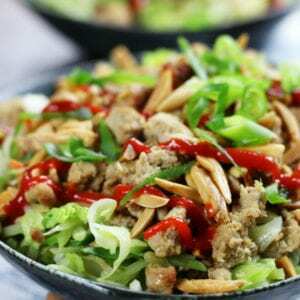 However, crispy it on a frying pan enhances flavor while imparting more flavor into veggies. What type of frying pan is best for making this dinner? I am not a huge fan of using nonstick pans but occasionally I find it helpful for certain recipes. This healthier nonstick pan is the one I used. It allows for less oil to be used while crisping the gnocchi. 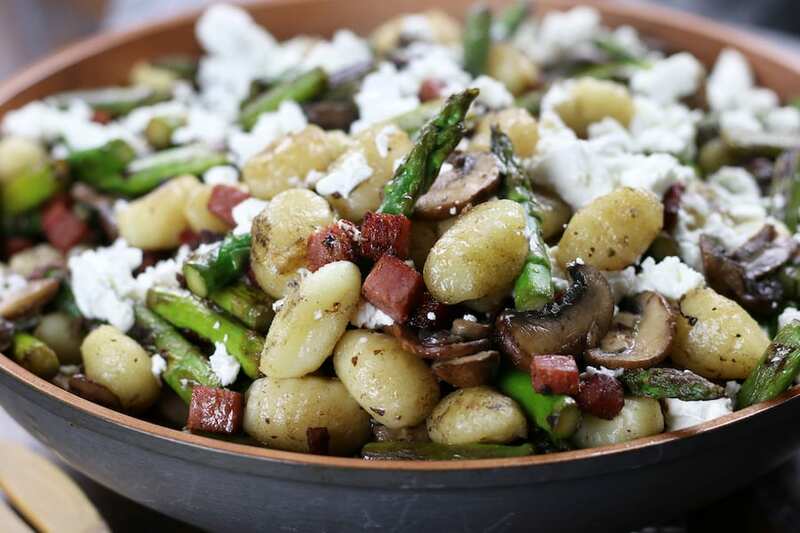 My mouth waters just thinking of this Easy Weeknight Gnocchi Skillet Recipe. Has crispy salami, sautéed asparagus, mushrooms and chèvre. 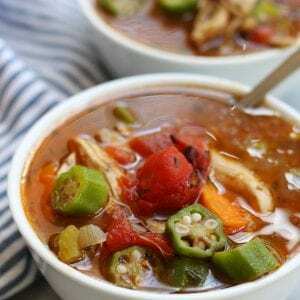 Bring a large pot of water to boil and leave boiling until needed. *Normally when cooking pasta heavily salted water is advised. 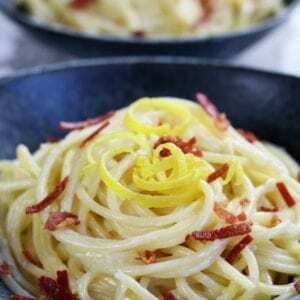 For this recipe skipping this step is suggested due to the higher sodium content of salami. Place a large skillet over medium heat. Add diced salami and cook until crisp, stirring occasionally, about 6-8 mins. Remove from pan with a spoon leaving behind rendered fat and set salami aside into a large bowl. Place same skillet over med/high heat. Add mushrooms and sauté for about 2 mins. Remove from pan and set aside into same bowl as salami. Place skillet back over med/high heat. Add 1 tbsp of oil and sauté asparagus until desired tenderness. Add garlic in the last few minutes of sautéing. 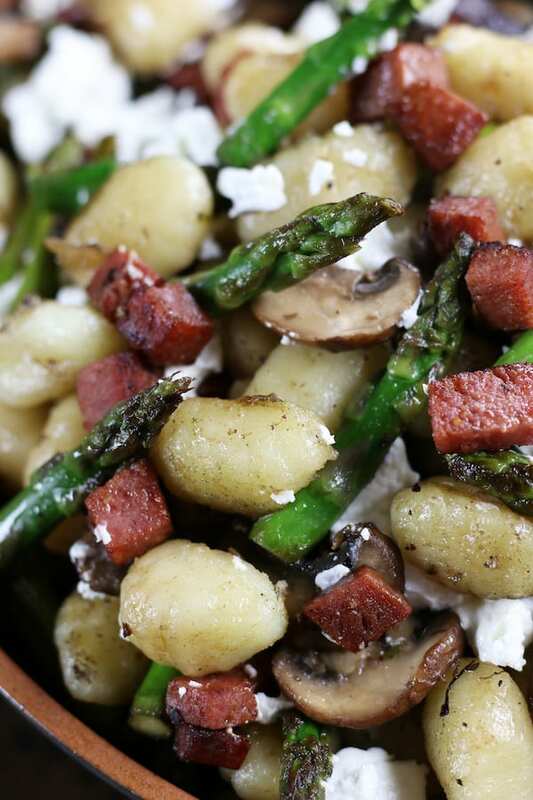 Remove asparagus and garlic from pan into same bowl as mushrooms and salami. Place skillet back on med/high heat and add another tbsp of oil to pan. Just before removing asparagus from skillet add gnocchi to boiling water. The second the first gnocchi floats to the top, transfer with a large slotted spoon to heated frying pan. Parboiling gnocchi should only take 1 1/2 mins. Stirring occasionally, let gnocchi continue to cook in skillet and become partially crispy, about 4 mins. Stir salami and veggies back into frying pan and turn off heat. Sprinkle with chèvre and cover skillet to let cheese melt for about 3 mins. **If using pre-packed gnocchi break apart prior to boiling and lower into boiling water using a large slotted spoon to help prevent splashing.